Due to the many possible categories of recipes out there, I'm going to place them in just a few - their approximate place of origin. If the recipe originated in France, it would be listed as European...etc. These recipes originated in North and South America; primarily, they are from the U.S. These recipes originated in Europe. These include, but aren't limited to: England, Denmark, Finland, Germany... etc, etc. These recipes originated in Eastern Asia; China, Japan, et al. Sorry - I'm still working on the European and Asian recipe sections... but as soon as I can finish up what I've got, they'll be up. Thanks for your patience! Questions? Comments? Leave me a note! This page last updated October 1st, 1999. Copyright pixel@ocbtp.com, 1997, 1998, 1999. 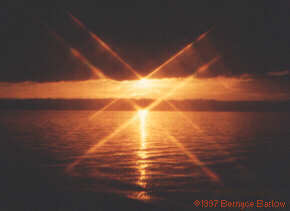 Photo of Kyack Point copyright Bernyce Barlow, 1997, 1998, 1999. Thanks, Bernyce! Return to Lady Pixel's Place! This page hosted by the OCB Tracker. Thanks, Tracker folks!